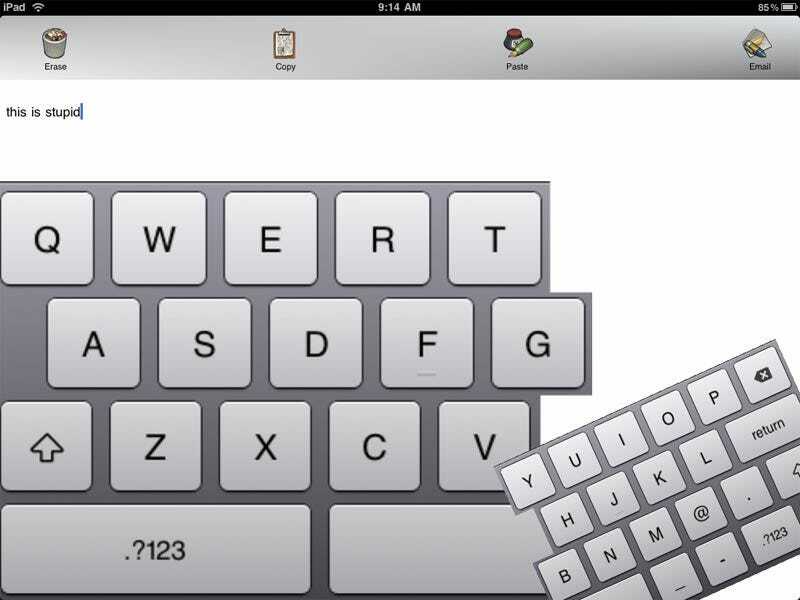 Keyboard Upgrade is an iPad app that allows you to split and resize the base iPad keyboard. For a moment, I thought this idea might be neat or even useful, so I dropped $1 to test it. I was wrong. Since developers can't modify the basic iPad OS, Keyboard Upgrade is similar to those old copy & paste iPhone apps. Meaning, instead of this new keyboard within things like Mail, you can only use the keyboard in its own app, typing there before migrate that text to wherever you'd like it. Believe it or not, this isn't my main qualm with Keyboard Upgrade. I expected the inconvenience going in. And as a guy who'd like to potentially write a lot on the iPad, it was a willing sacrifice. My main qualm is that it's no easier to type on Keyboard Upgrade's split keyboard than Apple's own. Even by smoothly pinch-zoom resizing each end of the keyboard to a size of your choice, it's still quite awkward to hold the iPad while thumb typing in any configuration—demonstrating why Apple didn't go with the split keyboard in the first place.